After reading an article I talked to other technicians, read books etc. and learned that thermography could be a very pivotal technique in the space of heavy mobile equipment. From there I used an old Fluke TI-30 thermal imager to conduct my own inspections with no formal training. I soon realised that there was a real world opportunity to take my passion further and to increase my knowledge with formal training. Thermography is a technique that can be very broad or it can be very specific and I can choose how to manage this. Also, thermography gives me the ability to constantly explore and challenge myself with new ideas and theories I may have on how to apply thermography to other industries or with in mechanics. I learned very early on that thermography is not a simple and easy as it looks, there are so many variables that I didn’t even consider from that point I realised that I need to complete formal IR training if I was to become a successful thermographer. 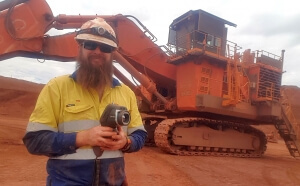 The greatest challenge I have dealt with is persuading managers and business owners of the benefits of thermography on the Heavy mobile fleet machinery, reducing costs without impacting the safety of personal and machinery. To become a successful thermographer you need to have passion and a willingness to complete a minimum of Level 1 certification. Doing the training will help you understand the technicalities that are involved and expose you to need to further your skills/ knowledge to grow into a successful thermographer. Experience will come with time. My approach is, until I am confident in the area/field I am conducting a survey in I will use a subject matter expert to aide me in taking the images, i.e. electrician, builder, engineer etc. doing this will help me learn more knowledge from these experts and also share my passion and benefits of thermography to these people. Having the knowledge of certified training with experience will give you a greater confidence as a thermographer to explain the benefits and capabilities to the end user. Curiosity, determination and having an open mind. Curiosity is due to always asking why, what and how etc. A question I tell myself multiple times a day is why is it like that? How do I confirm what I have found? Thermography is about identifying “not normal” so being able to understand “normal” is very important. Keeping an open mind is a big part of surveys, being able to resistant to your own biases will lead you to see the truth and allow me to question thoughts and findings that could arise letting me to give better judgment with the results. Passion, I know that this technology is an underutilised technique in a variety of fields. Having passion, determination and curiosity leads me to read and learn more and potentially giving me new ideas of how thermography can be adapted into new areas. At the time I needed a course that was able to let me do my training online and found that IPI was the only company that offered Flexible online training. This allowed me to keep working full time and study in my day off. Also the package has been developed by the world leaders in thermography, Infraspection Institute. The online training was very easy to follow and the support of IPI was spectacular. The classroom portion was led by two passionate facilitators for the technology and was very engaging, never a dull moment. The level of detail and knowledge from the facilitators was exceptional. The ability of both the online course and class room facilitators to explain all and any questions I had was perfect. When I started the course I thought I had some idea of what a successful thermographer would look like but I was so wrong. There are so many factors that impact the accuracy of a thermogram when temperature is used, it is not just a point and shoot practice. After completing Level 1 I knew what my limitations were as a Level 1 thermographer, and knowing this gives me the confidence to work within my skill set. I will be going back to IPI for Level 2 so I can progress and improve my confidence and knowledge. Being able to communicate your findings to the end-user is just as important as executing an accurate thermogram. The IPI training gave me the skills, knowledge and confidence to do just that. At the moment I have a Flir-E60 but it is not suitable for my current project that I am working on. With the help of Brenton Ward from IPI I have just ordered a Fluke Tix580 with 2x, 4x telephoto lenses. Tell us about the most important thermal exception you ever found? What did it mean for you or the end user? While I was doing a qualitative inspection of a Hitachi EX3600-6 excavator I found that one of the slew transmissions had a different thermal pattern to the others. The slew transmission was inspected and it was found that the internal gears/bearing was failing. The machine was scheduled in to have the transmission replaced. This prevented an unplanned down event and saved the business thousands of dollars. Patience, passion, networking and open to ideas. When I first got into a position where I could use thermography, I reached out to professionals internally, nationally and globally. I have found that the thermography community is generous with their knowledge and information. Share your reports and ideas to peers for their input and you will find that your knowledge will grow exponentially. Ensure that you data and findings are credible and un-biased when presenting to the end user. Always continue to increase you knowledge through formal training, on the job experience, peer on peer reviews, networking. There is always something new to learn.